On the cover. Gasterias are favorite plants for many growers. They can be by or small, form rosettes or distichous fans, and mnge in color from green to black to maroon, marbled with spots or without them, textured or smooth - offering, in other words, a wealth of possibilities to collectors who love diversity. And the hortcultural varieties tar outnumber the species, with variegates and color forms of unimaginable beauty, In cultivation they pose little problem, though cool humid nights can leave undghtty black lesions on the leaves. The Gasteria Bug hits some people so hard that they cross the globe to see them in their native habitat. Breck Breckrnridge did just that after he won a CSSA Schwarz Travel Grant, In this Issue he details his adventures with many fine photos and a story beginning on page 244. 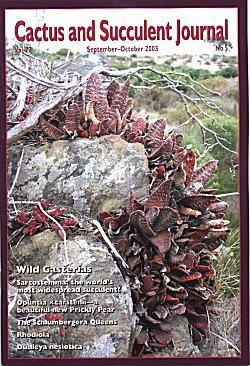 He also provided the picture on the cover a large clustering specimen of Gasteria carinata variety carinata found on a farm near Caledon in the Western Cape of South Africa, where this species grows on shale above a dry watercourse.